GoCart Racing - A Super Fun Fundraising Event! Home-made push carts... for example, a downhill derby! Track racing with engine run gocarts. Or a pledge per lap event. This has BIG potential! Each of these can be just as fun and profitable as the other, and each one will fit perfectly with a different set of circumstances, or different type of community. Obviously you will choose the type of gocarting that will fit better with what you have in mind, and with what type of community your supporters are from. 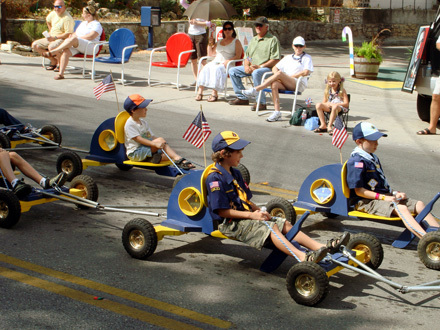 Are they hands on people with kids that would love to build gocarts and become the local downhill champion. Or are they jet setting businessmen who like to fly around a track at high speed! To be honest most people will probably enjoy both types of gocart racing, and with luck and good organization, you might be able to use both of them! Sponsors - Both corporate and individual. Adding other fit able fundraising ideas; like a Raffle or an Auction. Or through fundraising product sales like Organization Apparel from your SSA Apparel Fundraising Store, or Fundraising Lollipops, or Fundraising Discount Cards! For American Fundraisers you should grab a Free Fundraising Product Guide to see what product options you have! And obviously, as always, with donations. The great thing about both types of gocart racing is that you can hold them as a singular event or include them in a larger event, like at a summer fair! PLEASE NOTE! Before running any type of fundraising event you should read the 'running charity fundraiser events' page and also the Instant Event Fundraising System. 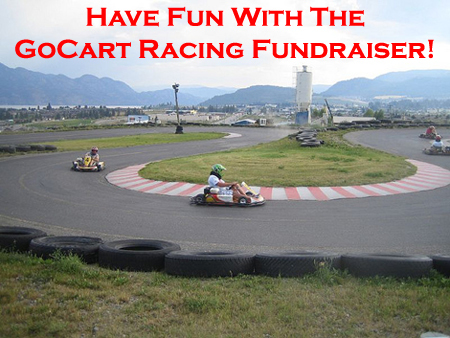 Out of the two types of gocart racing fundraisers this one will be hardest to organize... but it'll also probably be a more profitable fundraiser! Will it be a downhill derby or a flat race around a track with a pusher and driver the whole way... or maybe even a blind race where the driver is blind folded and the pusher has to shout directions to him! Once you've decided on how, you can then start planning the fundraiser. Make sure you plan your health and safety at the event properly... Have an ambulance or a first aid person standing by in case of accidents etc.. It will all add to the fun! Also look to have a few different racing categories, like a father and son category, or under 18 category! Make sure all your prizes are really super quality; no one wants to win junk! Make sure you get corporate sponsorships from local companies and businesses as well! You can even consider having a sponsorship competition where all the entrants have to get sponsors from family and friends or whoever they can get from. The person with the highest amount sponsored wins a prize! Obviously all the sponsorship money will be yours! One of the most important things you'll need to do is advertise properly. The more entrants and spectators you have, the more money you will raise. Simple! Advertise through your website and newsletters. Send out a press release to local radio stations and media. Put up posters and send out fliers! Do everything you can do while still keeping your advertising expenses as low as you can! And lastly, make sure everyone has the most enjoyable day of their lives. Ensuring that they will always be willing to help out your cause! For more ideas on promoting your gocart racing event read here. You will more than likely always hire an outside company for this. Whether you hire out their track for the day, or hire them to come set up a track for you with their gocarts (like during a summer fair), they will always make the running of a gocart racing fundraiser easier! Essentially, they will organize and run everything to do with the racing... You'll just have to get the racers there and run the money side of the day! They must have a decent health and safety policy. And must follow it properly. Mustn't be too expensive. You need to earn money from the event to! If they are expensive you won't be able to mark-up the entry fee much, which means that you won't earn much from the entry fees! Must be willing to work with charities. The company must be willing to let you run other fundraisers (like a raffle, betting or drinks stall) during the gocarting and if possible, have a reduced price for fundraising causes. You'll then need to obviously promote your event as much as possible to get as many people there as you can. If you're holding an event like a summer fair it might be an option to just rent out space to a gocart company, like you would to any other outside stand or stall. This will then mean even less work and worry for you. You can either do this as an individual or as a group of fundraisers. What you or your participants will do, is get people to pledge a donation amount for every lap completed in a certain time period. Either on an individual basis or as a group. As an individual you could look to break a record over 24 hours, and solicit supporters or businesses to pledge $1 or 50 Cents for every lap completed. Or as a group, each participant could recieve pledges and sponsorships for each lap that they complete. You can then give a prize to the participant who raised the most funds! This will be the simplest way of doing it, and I'd recommend you use DoJiggy's Pledge Fundraising Software for it. Take a good look around their site at the examples and information, and also setup a free trial with them to get a feel of how it all works! Whichever gocart racing fundraiser you hold, if you plan and organize it properly, it will be successful, fun and rewarding! And always look for other creative ways of making your event more profitable. The sky is the limit! If you want to hold other fundraising events I'd suggest that you also look at the golf day fundraiser. It can be a really profitable and rewarding Fundraising event. I wish you all the best of luck with your gocart racing Fundraisers!